Most people use a standard leader length of about 48 inches. This length of leader is sufficient for most 3-way applications. However, changing your leader length can make a big difference in putting more fish in the boat on a given day. When I start a search pattern trolling 3-way rigs in rivers, I always set each of our rods with different leader lengths. One rod will be at 24 inches. The rest I will increase the leader length 24 inches all the way to 10 feet. The fish will tell you where they want the baits. You simply change the rest of the rods to the length that is catching fish. The same holds true with the dropper length. A good rule of thumb to go by is the colder the water, the shorter the dropper. As water temperature increases, so should the dropper length. When you cast crankbaits, do you usually cast and reel? No, you change up your lure speed and pause the bait. This change of speed imitates a dying or fleeing bait fish, which, in turn, causes the natural instinct of the predator to strike. You can add this kind of action into your 3-way presentations by changing the size and the shape of the weight. For example, if you are running a 1 oz. pencil weight on a 3-way rig, the weight is sliding along the bottom, keeping the crankbait swimming with a non stop forward action. Now if I change the shape of the weight to a bell sinker, the action changes. The weight catches momentarily on the bottom. Thus, the rod loads up with a slight bend. As the weight frees itself, the rod springs forward causing the crankbait to lunge forward. As the weight catches on bottom again, the bait pauses before lunging forward. Now change the weight to a pyramid style sinker and the weight snags up a little longer, causing the rod to load up a little more, and thus, a longer pause and a sharper lunge forward of the bait. By increasing the weight of any given sinker, you can vary the length of the pause and sudden lunge of the bait. Try this the next time you are trolling crankbaits on 3-way rigs. I am sure it will help you put more fish in the boat. Trying to hold on the upstream face of a wing dam can result in drained trolling motor batteries and hard feelings when the wind is blowing and the current is strong. To conserve power, I will start up my Mercury 9.9 kicker motor on my Targa 2000. By using my kicker as my main base of power and steering with my bow mount electric, I can maintain a precise presentation and not drain my batteries, enabling me to hold on the wing dam all day if I choose. This will result in more fish because the fish always turn on when the batteries are going dead!!!! Professional Fisherman Daniel Vinovich will be taking over the host spot of the Fishing segments of the television show Illinois Adventure. The show has aired for the last 12 years on this P.B.S. affiliate WTVP channel 47. Dan will be replacing retiring host Jim Gardner. Dan will be filming on average 5-8 new shows per year. 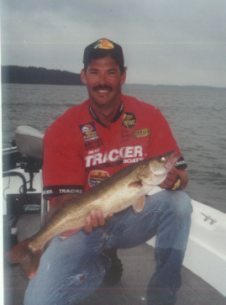 The shows will range from catfishing with a kid to tournament techniques for trophy walleye. They are also planning on filming at least one hunting segment a year. All of the shows will be shot on location at different state and private areas in the State of Illinois. The show airs on Thursday nights at 8:00 p.m. and again on Sundays at 4:00 p.m. We hope you can join Dan and his guests as they travel Illinois in search of adventure.